1 of 4 Bring a pot of lightly salted water to a boil. Add linguine and cook 9 minutes or until al dente. 2 of 4 Meanwhile, in a small bowl, whisk 2 tbsp of the olive oil with the lemon juice, zest, salt and pepper. Set aside. 3 of 4 Heat 1 tbsp of the olive oil in a large skillet over medium heat. Add shrimp. Saute 1 minute; flip and saute 1 to 2 more minutes, until just cooked. Remove to a plate. Add remaining 1 tbsp olive oil to skillet; stir in fennel and onion. Cook 7 minutes, until softened. Stir in garlic; cook 1 minute. Stir in reserved olive oillemon mixture. Bring to a simmer and cook 1 minute. 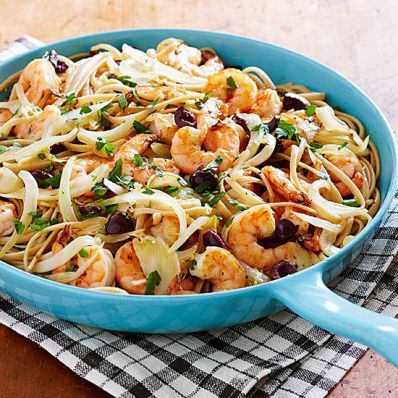 4 of 4 Remove cooked pasta from pot with tongs and add to skillet, along with 1 cup of the pasta water, the cooked shrimp and olives. Bring to a simmer and cook 1 minute. Stir in parsley. Serve immediately. Per Serving: 14 g Fat, total, 402 kcal cal., 582 mg sodium, 27 g pro., 9 g fiber, 49 g carb., 2 g sat. fat, 168 mg chol.